Usha moved to the US and to Cary in early 2012 from Beijing. She has previously lived in Singapore, Malaysia, and Germany. 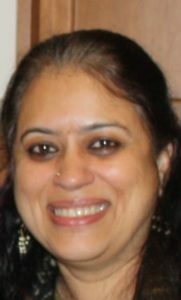 Usha has worked as a copy editor with several newspapers and magazines in various countries. She is now a freelance writer and editor, specializing in academic editing. She has two sons, one of whom is a University of Chicago alumnus, and the other, a freshman at UNC,Chapel Hill. Usha also volunteers with the Wake Literacy Council and the Autism Society of America. She enjoys Indian classical music and reading. class="pirenko_team_member-template-default single single-pirenko_team_member postid-3120 samba_theme samba_left_nav samba_left_align samba_responsive ecwd-theme-samba wpb-js-composer js-comp-ver-5.4.5 vc_responsive"